Different ways of making your own herbal medicines for various diseases, used in Indonesia for centuries . note: Please consult with your doctor before trying this recipe. Noni or Morinda citrifolia including a family of coffee trees, Noni can grows in the lowlands up to an altitude of 1,500 meters above sea level. Noni is a native plant of Indonesia This plant has a trunk that's not too big, 3-8 mtr tall. The leaves composite facing each other, 20-40 cm long and 7-15 cm wide, flowers shaped Excrescence flowers are small and white. The fruit is glossy green and has oval-shaped with a variety of spots. has plenty seeds contained in the fruit flesh. In general, the noni plant growth in the wild, the forest or maintained on the outskirts of home gardens. Hypertension, jaundice, fever, influenza cough, abdominal pain, remove scales on the feet. Ingredients: 1 noni fruit, 0.5 handheld of Mentha arvensis L. var Javanica Bentham leaf (mint). Method: Both ingredients are boiled with 2 glasses of water to boil down to 1 glass, strain. How to use: Drink every 2 times a day, morning and afternoon. Ingredients: 1 Noni and a rhizome of Kaempferia Galanga. Method: Both materials are boiled with 2 glasses of water to boil down to 1 glass, then filtered. Ingredients: 2 ripe noni fruits on the tree, a tablespoons of honey. Method: Noni fruit is squeezed to take the juice. Mix with honey until evenly, strain. How to use: Drink every 2 days. Ingredients: Noni fruit ripe on the tree. How to use: scaly leg rub with Noni fruit until evenly distributed. Leave for 5-10 minutes. Wipe with a clean cloth moistened with warm water. Ingredients: 2 ripe noni fruit on the tree, a piece of sugar cube, honey. Method: Noni fruit is squeezed to take the juice. Mix with honey and sugar cubes until evenly and then filtered. How to use: Drink and repeat every 2 days. Ingredients: 2-3 leaves of Morinda citrifolia (Noni). Method: Ground till smooth, add salt, pour boiling hot water. How to use: Once cool filtered and drink. 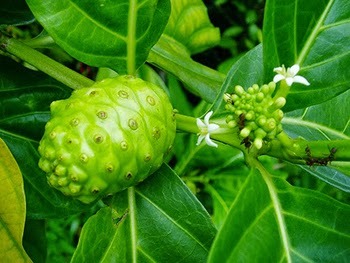 Ripe noni fruits plant has a unpleasant scent , but it contains a number of substances that are efficacious for treatment. The substances are Morinda diol, morindone, Morindin, damnacanthal, methyl acetyl, and soradiyiol kapril acid. Asep Petir 1 @ 2014. Simple theme. Theme images by Jason Morrow. Powered by Blogger.